The Curious Case of One All-Time Great in Madden's "Connected Careers"
This screenshot isn't new but it is revealing. Kurt Warner last played in the NFL in the 2009-2010 season. Of the 24 players on Madden NFL 13's "Canton Greats" roster of throwback stars, he was the last to retire. And here we see his return to the league touted in the game's new "Connected Careers" mode. This is interesting for a couple of reasons. "Connected Careers" will allow you to play as any active coach or player. Playing as a coach means you control an entire team, like the old Franchise mode; playing as a player allows you to play as a single player, like Superstar. Everyone works in the same universe, with some limitations. For this, there are also some Hall of Fame coaches and players that are available for use in Connected Careers. But the assumption is that they will only show up in your league if you (or if another human in an online-enabled league) chooses to play as them. Here we seem to be seeing the introduction of a Canton Great back into the league by the CPU, which is very intriguing. Back in April, as "Connected Careers" was being unveiled, EA Sports' Josh Looman touted the possibility of players coming out of retirement to rejoin the league, a nearly annual storyline that has been painfully familiar to football fans thanks to Brett Favre. I asked directly, if jokingly, if EA Sports had the rights to use Favre's likeness in Madden 13 and was told no. Is Kurt Warner the only player who will come out of retirement to rejoin the league? Literally speaking, that's doubtful. As a Connected Careers dynasty advances into its hypothetical future, you might see active players like Tom Brady retire in 2015 but maybe come back in 2016. But for 2012, I wouldn't bet on seeing, say, LaDanian Tomlinson reconsidering last month's decision to call it a career and return, because once he left the league, he was no longer covered by the NFL Players Association group license that allows the use of players' likenesses throughout the game. Warner and EA Sports had to cut a special deal. 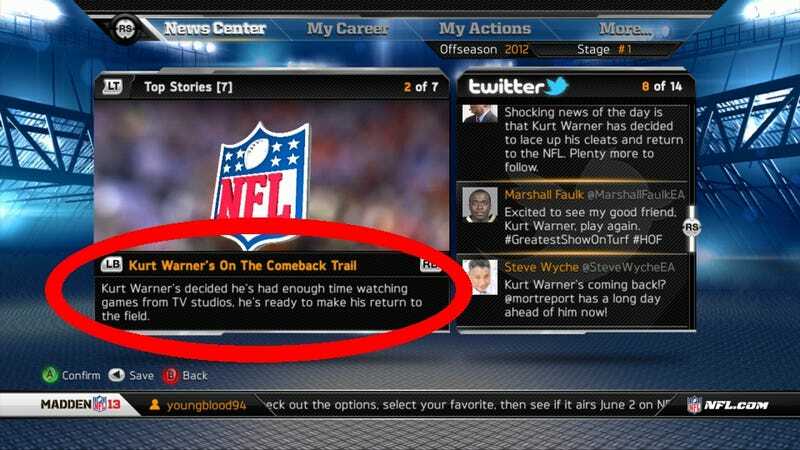 All of this means to me that if Madden 13 has the rights to one player who is fully retired, yet is in reasonable shape to return to the league, and releases a screenshot of a situation describing exactly that, it's practically a mortal lock everyone will be seeing Kurt Warner return to duty in the first year of their "Connected Careers" universe. Derrick Brooks, also on the Canton Greats roster, retired a year before Warner, which means we may be seeing him return to action, too. The second question then is, how would the player be rated? Warner's Canton Greats rating is based on 2001, one of his greatest seasons ever. There's no way he's in the same shape a dozen years later. I asked Madden's ratings czar, Donny Moore, if Connected Careers would allow for the CPU-controlled unretirement of someone like Jerry Rice (who last played in 2005), and didn't hear back. Let's assume that's a no, because six of the Canton Greats players are dead, and you just can't have them in a league unless you know the person who brought them back. In sports video games, reality-shattering choices should never be made by the game itself, they should be made by a human player. When you unlock all-time greats for use in NCAA Football or NBA 2K, they come to the league under human control, for instance. But if a game has two players who could, conceivably, return to duty in real life (Brooks would, admittedly, be an enormous longshot at a position like linebacker), and the game is trying to make a splash with a story-generation engine and even a virtual Twitter feed, why wouldn't their unretirement be coded into the game?